1. Familiarize your child with Scripture at home. Just as children look forward to reading their favorite parts of a book they know by heart, children are more likely to look forward to church services if they recognize names and scenes from Scripture. There are many scenes in the Bible that our children can enjoy learning about at home, such as: the humorous image of Zacchaeus climbing a tree to get a better look at Jesus, the vivid pairing of animals shuffling into Noah’s Ark, and the powerful retelling of the Nativity of Jesus. When we familiarize our children with Scripture at home, we can help spark our children’s interest in the readings discussed at church. Most children don’t wake up Sunday mornings rip-roaring ready for church. Understandably, they’d rather spend their Sunday at home, playing or watching TV. One way to show our children the importance of keeping the Sabbath holy is to go to church even when we don’t feel like going either. There are plenty of excuses we, as parents, can use to avoid going to church. We may have pressing errands to run, we may be stressed from work or home obligations, or we may be grappling with depression or anxiety and would rather stay in bed, covers pulled high over our head. It’s during these times of tail-spinning that we must reprioritize by seeking God’s kingdom first (Matthew 6:33). When we do this, we become restored with the knowledge that if we abide in his Word, God will heal and sustain us (Psalm 147:3-6). By making church a priority in our lives, we set an example for our children to follow about the importance of putting God first, no matter the circumstances. 3. Go to church as a family. When families go to church together, it connects them in a way that attending other functions together does not. Church services are hopeful, community-centered, and comforting. Jesus assures us that, “For where two or three gather in my name, there am I with them” (Matthew 18:20). Imagine the sense of security that can wash over a child in knowing that where he, his mom and dad (or grandma and grandpa) are united in prayer, there is Jesus. Imagine how magnified that sense of security becomes when the child sees that his family is united with a much larger church family, joined together in common worship. As any parent of a little one will tell you, when a young child’s boundless energy is stifled in a setting where he’s supposed to sit still for long periods, bursts of antsy fidgeting result. This is especially at church. 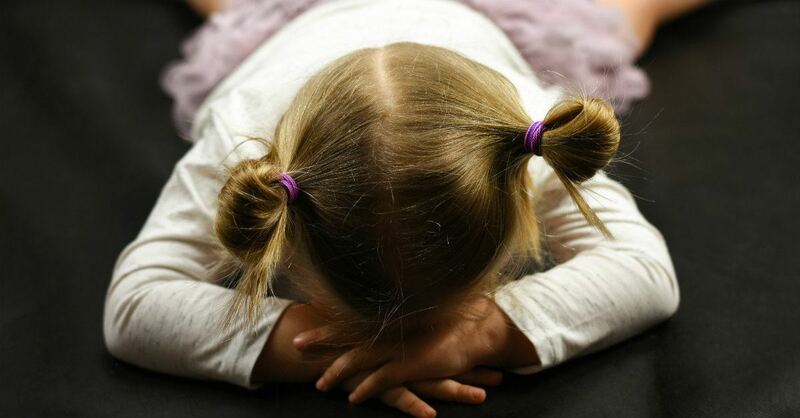 When children are preschool-aged and younger, they’re in the process of getting accustomed to sitting still in a pew instead of in Mom or Dad’s lap. What they aren’t doing yet is understanding much of anything going on around them. To make service a more pleasant experience for your little one (as well as for yourself and those around you), you may want to take a doll, small toy (with no lights and sounds), or a coloring book and crayons to keep your fidgety young child quietly engrossed in play during the service. Some churches also allow parents to bring small snacks for children, as long as you make sure to clean up any remains. 5. Use the amenities available. Churches are family-gathering locations and, as such, many churches offer accommodations for children. Some churches offer Sunday school classes that are taught in separate rooms, allowing the parents to listen to the message more attentively. Other churches have cry rooms set off from the main church area for privacy but equipped with speakers so that you can hear the ongoing service. Some cry rooms are also furnished with soundproof glass, allowing you to watch the service through the glass as you listen through the speakers. Using these amenities is a win-win, as your child is in a setting more conducive to her energy level and attention span, and you are in a setting that allows you to enjoy the services more comfortably. 6. Help your child feel comfortable at church. Gone are the days when children show up to church wearing cumbersome hats, stiff shirts, and uncomfortable shoes. While some may miss what “Sunday best” used to look like, dressing our kids appropriately for church today doesn’t have to include attire that leaves our kids tugging at their clothes in discomfort. Instead, children can be well-dressed and comfortable on Sundays in nice-looking apparel made out of cotton or jersey knit, and fashionable footwear with rubber soles. Conversely, you may have a child who jumps at the chance to wear her dressiest clothing out. In that case, let your child attend church dressed to the nines and match your attire accordingly to make it a fun family affair. Last, in the rush of getting our kids out the door to church, we parents may overlook other obvious ways to help our kids feel more comfortable at church. Examples of easy ways to promote comfort are: making sure the children are fed, rested, and have gone to the restroom/are wearing a clean diaper before service. 7. Handle criticism with grace. On any given Sunday, it’s common to see new parents spend the entire service wrangling a squirming young child while simultaneously consoling a wailing younger child. At the end of service, the parents gather their little ones, balance a diaper bag and other belongings on their shoulders, and trek out to the minivan. As the young parents head to the parking lot, an older church-goer or two follows them and regales the young couple with stories of how when their children were that little, they “sat so nicely in church every Sunday.” These stories of yesteryear offer the speaker flickers of fond (if not rose-colored) nostalgia; but to the harried young parents, the stories amount to stinging criticism. In a moment of frustration, it’s easy for the young parents to feel justified in responding defensively. However, their children would be witnesses to this tense exchange, and that can cause the children to associate negativity with church attendance. The better strategy for addressing criticism is to offer the critic grace, considering that there are many parents of grown children who rarely see their adult children or grandchildren, let alone get to go to church with them. In keeping this humbling reality in mind, we can give grace in the face of criticism by offering the critic a smile and a sincere “have a nice day.” This measured response has the added benefit of letting your children watch you act with goodwill over reproach toward a fellow churchgoer. 8. Remember your biblical responsibility to your children. Jesus himself loved children so much that he rebuked his disciples for preventing children from approaching him, saying: “Let the little children come to me, and do not hinder them, for the kingdom of heaven belongs to such as these” (Matthew 19:14). Scripture further instructs us to be mindful of our responsibility to our kids: “Start children off on the way they should go, and even when they are old they will not turn from it” (Proverbs 22:6). There will be times when our resolve to attend church as a family will start to buckle under the weight of our children’s protests. At these times, we can fortify ourselves to overcome this struggle by looking to Scripture’s command to bring our children to Jesus and to start our children off in life on the straight and narrow path. 9. Strengthen your resolve with the research-backed benefits of church attendance. Not surprisingly, research proves what Scripture has told us all along—that going to church on a regular basis nourishes us mind, body, and soul. 10. Encourage your child to join church-based groups. When we take our kids to church, we introduce them to a community of like-minded people who come together to worship as one. Faces in the pews become more familiar by the week, and friendships begin to blossom within this church community. Maintain your resolve for attending church as a family by using the strategies above and by keeping your eye on the bigger picture—the importance of setting your child off on a path illuminated by the light of God’s Word. Dolores Smyth draws inspiration for her writing about parenting and faith from everyday life. A perfect day for her includes running, reading, and spending time with her husband and three kids. Connect with her @LolaWordSmyth.